Countdown to the Holidays Sale Event! Dec 12-14th! All locations! Mon Dec 12 – Island of Misfit Toys! Do you still need that awesome toy for someone? Or maybe you need a sweet new figure for yourself? Why not get both! Get all toys, mix and match, Buy 3 get 1 FREE! Lowest priced qualifying item will be FREE! Tues Dec 13 – It’s… Holiday Adventure Time! All NDC locations have a full stock of Adventure Time hardcovers and graphic novels and are all HALF PRICE today! Plus, with each one purchased, you get a FREE limited edition Adventure Time comic! Weds Dec 14 – Now that’s a glove! Get a Witchblade Vol. 1 Graphic Novel JUST $3! Originally $19.99! Plus, buy volume 1 and you can get volumes 2,6,7,or 8 for just $2 each! That’s a brick of reading, valued at $80 for just $11! Thurs Dec 15 – Sonic Stocking Stuffers! We have select volumes of Sonic the Hedgehog classics, including volume 1,on special for just $1 each. These were originally $7.99! But today, it gets even BETTER! Snag 8 for just $5! Perfect for all the young readers on your list. Fri Dec 16 – The holiday RUSH! NFL Rush Zone Team Exclusives! An officially licensed comic variant cover for EVERY TEAM! Get your favorite team for just $5 (we will transfer it if out of stock) and get the NFL Rush Zone Graphic Novel, a $20 exclusive only available at the Super Bowl, FREE! Sat Dec 17 – Better than Reindeer Games! The holidays are great for getting together, which means it’s time for BOARD GAMES! Check out 100s of Board Games, perfect for gifts or just having fun with family and friends. Get your choice of some great games Buy 1 Get 1 50% OFF! Sun Dec 18 – Double Take Universe Deals! These 10 titles expand on this classic world of Night of the Living Dead. Perfect for the horror fan on your list. Or YOU. 2 ways to enjoy: One, you can buy the bundle of all 10 1st issues, originally $20, for just $3! Or, dive in all the way with all 10 of the graphic novels, a $100 value, for just $20! Mon Dec 19 – Who doesn’t enjoy a good book? Shop our huge selection of 1000s of Graphic Novels and get your choice of any Hard Cover, Buy 1 Get 1 50% OFF! Tues Dec 20 – Some light Holiday Reading! Christmas Comics just 50 cents! All year long, our collection processing elves set aside Yuletide comics to offer you. These books are a great deal for a dollar each at our stores now, today they are only $0.50 each! Weds Dec 21 – Nothing says the wholesomeness of the holidays like Archie! We have deluxe magazines, digests, and graphic novels, 8 to choose from, for just $3 each! Many originally priced at $11.95! Or… save more and buy all 8 for just $20! Thurs Dec 22 – Fragile!… It’s a major award! What does that nerd in your life need? An immortalization of their favorite character you say? Good thing we carry tons of awesome statues! Get yours today 25% OFF marked prices! Fri Dec 23 – Time Lords a leaping! Pick up the Dr. Who Annual Hardcover, originally priced at $12.99 for just $1. Plus, shop our special box of Titan Dr. Who comics for just $1 each or get 15 for $10! Sat Dec 24 – A Holiday feast! Enjoy all the previously listed sales all at once! 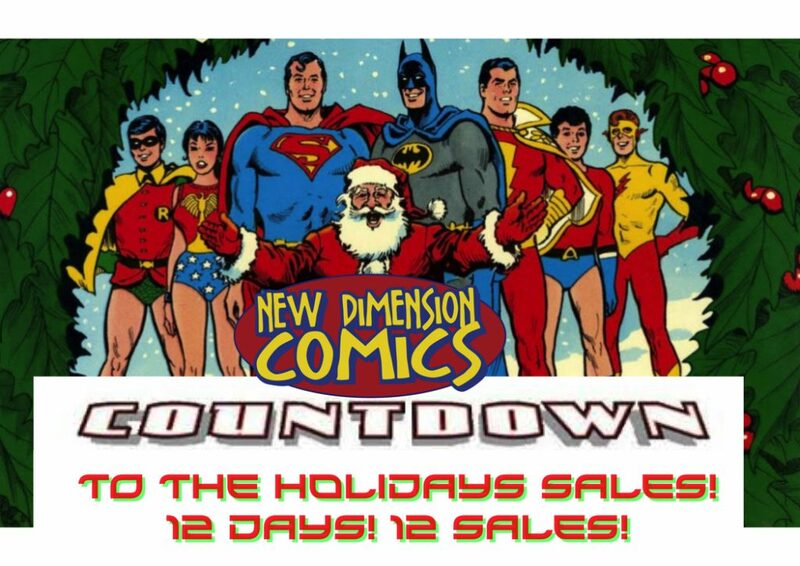 Have a Safe and Happy Holiday from New Dimension Comics! *Some items may be excluded per location. Check with your local NDC for more details!